Looking for siteground coupon code, I discovered that all of them are just fake.Don’t fall for siteground coupon scams!. In fact, Siteground Does n’t offer coupon code for their services! If you find someone claiming to offer a money off coupon for siteground hosting plans, click that close button, because it’s not the real deal. How Can I Get Siteground Discount? StartUp : Designed with start up web sites in mind, the StartUp package gives you one website with 10GB of web space and is ideal for up to 10,000 visitors a month. StartUp usually retails for $9.95 monthly, now available for $3.95 monthly. GrowBig :Designed to help your website grow, GrowBig comes with all the essential features of StartUp plus premium features including premium support, a free SSL certificate, SuperCacher for enhanced speed and 30 available backup copies. You can have multiple websites and enjoy 20GB of web space, which is ideal for up to 25,000 visitors a month. 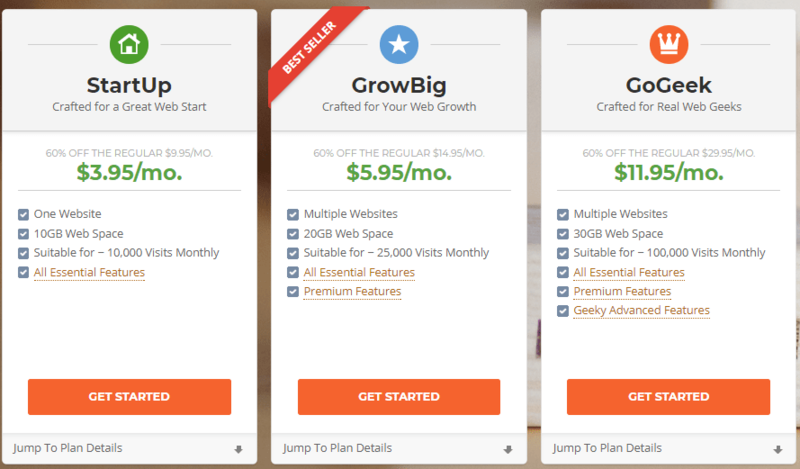 GrowBig usually retails for $14.95 monthly, now available for $5.95 monthly. GoGeek : Designed for web geeks who need a little extra, GoGeek comes with all the premium features of GrowBig, plus advanced features including less accounts per server, advanced hardware, free PCI compliance and pre installed Git and Staging. GoGeek covers multiple websites and 30GB of website, and is ideal for up to 100,000 visitors a month GoGeek usually retials at $29.95 montly, now available for $11.95 monthly. Once you’ve chosen your package, simply click “get started”, choose your domain name, and fill out your personal and payment details to start enjoying fast, reliable web hosting. Unlike many other hosting providers siteground advertised discount applies to any of the initial periods chosen during the sign up process. SiteGround’s service is specifically designed for maximum security and reliability, by people who really know web hosting. That means you can relax knowing that your website is in safe hands. All SiteGround packages come with essential features including free website transfer, unlimited data transfer and email accounts, unlimited MySQL databases and a daily backup of your website. All this plus a free web domain, 99% guaranteed uptime and 24/7 customer support, backed up by a 30 day money back guarantee. If you want to take advantage of the SiteGround difference, you might ask yourself about SiteGround and does it really work? A search online may even turn up several SiteGround coupons. However, these coupons aren’t valid – and that’s ok! With SiteGround’s fantastic prices and the low price promotions they are currently running, you won’t need a SiteGround coupon to make impressive savings on your web hosting. SiteGround takes your website’s performance seriously. SiteGround offers a choice of three strategically placed data centers in Chicago, Singapore and Amsterdam. Each location has been hand picked for optimum network connectivity. Being able to choose the data center that’s closest to the majority of your visitors means enhanced performance for your website, keeping you and your visitors happy. Each data center employs multiple power feeds in addition to their own generators, helping to protect your website from slowness or down time due to power outages. It all adds up to a powerful engine for your website. SiteGround take your security seriously too, with each data center employing 24/7 security including security guards, access control, video surveillance, a bullet proof lobby and even the use of biometric data. When you choose hosting through SiteGround, you can relax knowing your website is well protected! SiteGround has every right to be proud of its unique server set up, which has been hand crafted to provide your website with fast, secure servers that you can rely on. SiteGround staff continuously test and optimize their server hardware to make sure you’re always getting the best possible performance for your website. Their hardware is constantly being upgraded, and if a better configuration is found for your server, you can trust the SiteGround team to move your website to it effortlessly, without you needing to even think about it. SiteGround even keeps spare servers ready to go within minutes, so no matter what happens, your website performance comes first. SiteGround’s dedication extends to software too. Their unique isolation technology keeps each website isolate from others on the same server meaning that if one website has an issue, every other one will be completely safe. That means you’re getting the security of an expensive dedicated server solution, without the cost! SiteGround will make sure you always have the latest version of any software, and will even write their own patches to protect your website in the event of third party software such as Apache or PHP being compromised if an official one isn’t yet available. For people who have blogs, websites and businesses online, hosting infrastructure is very important. It makes sure that your websites are always active, your traffic has a smooth user experience and your business performs effectively. Therefore, always keep in mind the scale, functions and size of your online business while choosing a hosting provider and their services. I for instance, use SiteGround hosting for some of my private blogs as it is relatively cheap and offers a wide range of services. Since, its inception in 2004, SiteGround has been providing selective hosting services to 1000s of satisfied customers. Even today it processes over 1800 tickets, 1000 phone calls and 2500 chat request each day. Host of powerful features, all-round management and awesome customer support are some its trademark characteristics. In this review we will look at what each plan has to offer and how effective SiteGround Hosting services actually are. With plans starting from USD 3.95 a month, SiteGround offers extensive features in shared hosting. It has a 3-click setup infrastructure and comes with a drag and drop website builder to help you setup a personalized online space. Also, you can migrate one site from any other hosting framework to SiteGround absolutely free. Their tech guys will do it for you. You have 24*7 support if you run into any trouble. All shared hosting plans come integrated with Joomla and WordPress (optional). The user interface is slick with an all inclusive user area, equipped with easy to use tools and beautiful designs. It allows for one stop management of your entire website. Daily Backups for added protection, HTTP/2 Enabled servers for enhanced speed. Unlimited traffic and emails along with CloudFare Content Delivery Network to make your life easier. With the Grow Big plan you get privileges like priority support, host multiple sites, higher speeds using supercacher technology and more. Cloud hosting is a proactive way of scaling your business forward while keeping the indirect hosting costs down. Using servers at multiple locations, the traffic load for a particular website is divided. This boosts performance and increases the capability of your business infrastructure. With SiteGround cloud hosting, there are packages available across all budgets. If you still cannot make a decision. You always create your own custom plan. Higher efficiency and site speed, courtesy of the lightweight Linux containers that are used with SSD disks for unmatched performance. SiteGround does the whole management of your servers. They manage your infrastructure and server software. As and when you need to add resources to your infrastructure you can do so in the matter of a few clicks. You can also set them to auto scale in the event of sudden traffic spikes. You get free CloudFare CDN and the support of servers spread across multiple locations. The packages integrate seamlessly with WordPress and provide features like 1-click installation, WordPress Staging, SSH & WP-CLI, auto updates, and Supercacher and GIT integration that helps in ecommerce. It goes for Magento integrations also, which come in with unique caching for enhanced speed, 1-click installation, pre-installed GIT for ecommerce and enabled SSH for enhanced control. The packages integrate with Drupal and Joomla too. Other features include complete WHM and a centralized cPanel from where you can manage all your websites. You also have Softaculous Auto-installer, MYSQL 5 & PostgreSQL for DBMS and email frameworks to make your operations much more efficient. Dedicate hosting infrastructure is ideal for businesses that have huge traffic coming to their websites and lots of transactions happening each day. It employs one single server with chosen specifications to your requirements. Therefore, because of the allotment, performance heavily increases. Multiple server locations to choose from for the best performance. They have an exclusive selection of hardware in the form of high performing Intel XEON processors and stable machines located at the best data centers. The complete management is taken care off by SiteGround. They will set your server up, keep the software up to date and monitor your machine 24*7 to constantly nullify any issue. It integrates seamlessly with WordPress and provides auto updates, SSH and WP-CLI access for greater control, WordPress Staging and GIT integrations for ecommerce. It integrates excellently with Joomla and provides automatic updates, Joomla Staging, jHackGuard installation for added security and GIT integrations. You can also install Magento with a single click. Apart from these you get all other features discussed above like WHM and cPanel, Email Software and more. I have to tell you that I have never seen a unique reseller hosting plan like SiteGround offers. If you are digital marketer and manage websites for your clientele then you must try SiteGround’s reseller packages. With reseller hosting packages you get a lot of features like 10 GB web space, unlimited data transfers and free daily backups. You also get SSH access and cPanel to manage everything from one place and an unlimited MYSQL Data base for all your DBMS needs. Other additions are free email accounts, 4 server locations, unlimited FTP accounts and Free CloudFare CDN for content management. This program is unique to SiteGround. As a reseller you can buy credits, which give you certain privileges. These credits never expire and can be used at anytime to avail a discount or launch or renew your account. 1 Credit equals 1 year of hosting. It is ideal for Resellers who need instant upgrades and renewals from time to time. To know more about SiteGround Reseller Hosting, Click here. If you are someone who works expressly with WordPress then what better than customized hosting plans for WordPress. You can launch your website with a single click. You have the Supercacher with 3 levels of caching for ultra-high speeds. Updates are installed automatically to keep the WordPress version latest. You can easily test and deploy changes using WordPress staging. If you are more into personal customization then you have the WP-CLI enabled so that you can tweak the command line protocols to suit your needs. GIT framework is pre-installed for ecommerce support. Enhanced Speed is also guaranteed through SSD hardware, Intel XEON processors and Nginx technology. You have PHP1 and HTTP/2 for high performance. Data Backups on a daily basis provided added data security. Joomla is an extensively popular CMS used for website creation and management globally. SiteGround provides tailor made Joomla Hosting Services across all ranges and budgets. Dynamic caching to increase speed is available on Grow Big and GoGeek plans. Complete speed optimization of entire Joomla infrastructure. Site uptime is mandatory to maintain at all costs. While all hosting services promise 100% uptime, not all land on them. SiteGround however ensures 99.99% uptime based on its hardware and software technology. Linux Based Containers add stability during traffic spikes. Proactive server monitoring allows for minimal error and quick response to action. In-built backup systems are consistently making daily and monthly backups to provide data security. Account isolation is maintained through CHROOT technology, which adds to security and saves your websites from malicious activity. Know more about SiteGround uptime tech here. If you are an affiliate marketer in the hosting niche then SiteGround is an excellent option. Commissions can go as high as $125 per sale. Click here to know more. All in all, I have to say that the offerings by SiteGround are relatively cheap, come with powerful features and add-ons and are very beneficial for all kinds of online businesses. I am currently using it for some of my blogs and will soon get a dedicated server to bring all my websites under one management roof. If you also have similar requirements then I guess you should give this hosting service a try. They have a 30-day money back guarantee on all their packages. So, your investment will be completely risk -free. Do let me know about your experiences, doubts and reactions over using SiteGround hosting. If you’re looking for web hosting that out performs the competition in terms of dedication to security and speed, check out SiteGround today!